Keira Knightley stepped out at the Chanel show during Paris Fashion Week sporting a chic, angular bob–a big departure from her usual long, wavy locks. Keira’s been MIA on the red carpet this year and seeing her out and about at Chanel reminded us just how much we’ve missed her. Girlfriend knows how to dress herself and her hair and makeup are always on trend. This cute crop is no exception–we love how the graduated cut of the bob helps emphasize the angles of her face, making her gorgeous long neck and killer cheekbones really stand out. What do you think of Keira’s hot new haircut? 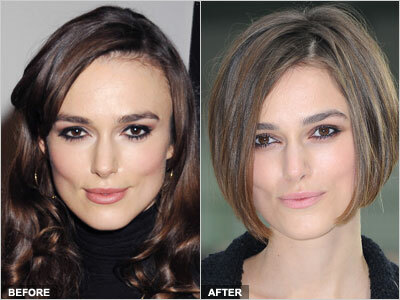 Try on Keira Knightley’s chic new hairstyle in the Makeover Studio!